Can I buy blueprints and build my own kayak? Unfortunately, I don't have any blueprints that I can recommend. I build kayaks without blueprints, based on a pattern I've learned through collaboration, experimentation and experience. 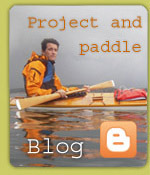 I think that kayak construction is best taught by personal instruction, which is why I give courses. There are many books about kayak construction, building guides and instruction videos, especially American ones. Most of what I've seen is incomplete and easy to misunderstand, which can lead to a poor end result. I think it's a shame when people use hundreds of hours and run up substantial expenses to purchase materials, but have little to show for it.